"Bhopal Gas Tragedy: Protests Held on 30th Anniversary Of disaster." The Financial Express. N.p., n.d. Web. 13 Dec. 2014. 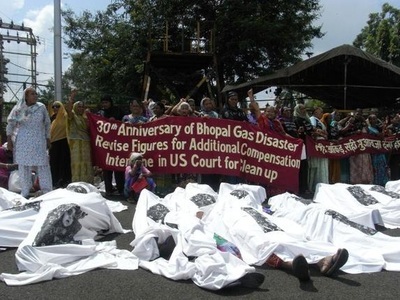 <http://www.financialexpress.com/article/miscellaneous/bhopal-gas-tragedy-protests-held-on-30th-anniversary-of-disaster/15408/>. "Images from the Bhopal Gas Tragedy Protests at Jantar Mantar in Delhi."Dna. N.p., n.d. Web. 13 Dec. 2014. <http://www.dnaindia.com/india/slideshow-images-from-the-bhopal-gas-tragedy-protests-at-jantar-mantar-in-delhi-2034452>. 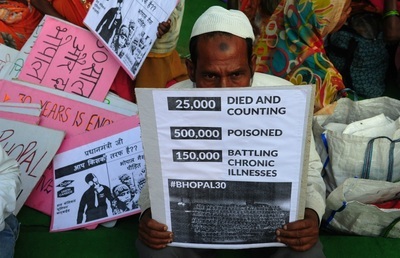 "Bhopal Gas Tragedy Anniversary: Protests Held to Seek Justice for Victims." The Economic Times. N.p., n.d. Web. 13 Dec. 2014. 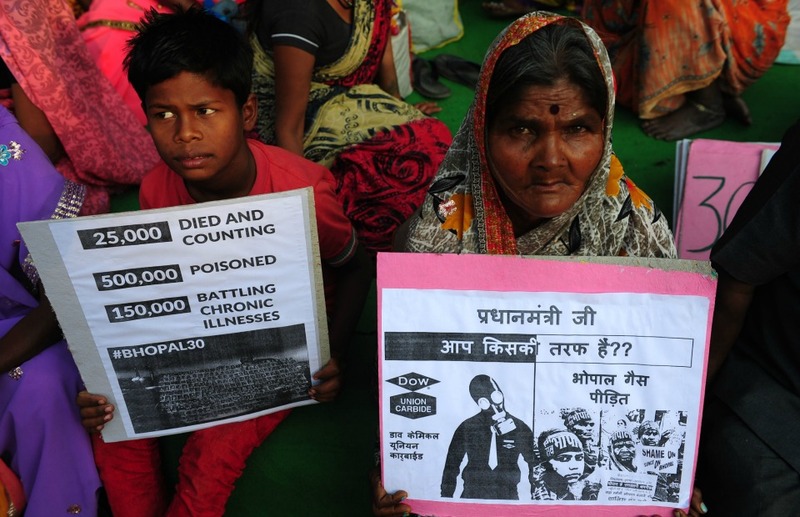 <http://articles.economictimes.indiatimes.com/2013-12-03/news/44710530_1_gas-victims-bhopal-gas-bhopal-group>. 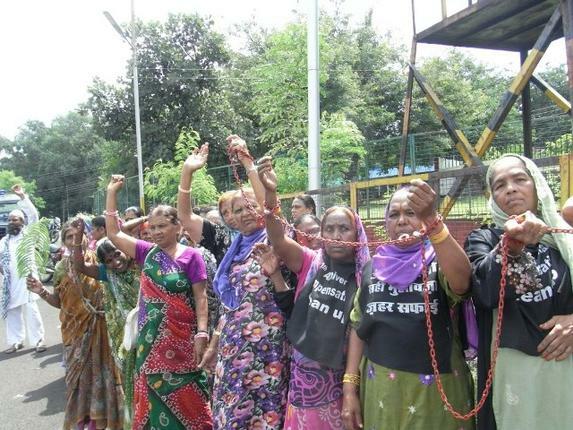 "Bhopal Gas Tragedy Victims Protest outside CM's Residence." The Hindu. N.p., 18 Sept. 2014. Web. 13 Dec. 2014. <http://www.thehindu.com/news/national/other-states/bhopal-gas-disaster-victims-chain-themselves-to-chouhans-house/article6422677.ece>. Although it has been 30 years since the incident occurred, its effects are still very prevalent among the survivors and their families. No realistic compensation has been given to the victims yet. On 3rd December, 2014, the 30th anniversary of the disaster, there were many protest throughout the country. Hundreds of protestors took to the streets against Dow Chemical (the company that bought Union Carbide in 2001) seeking justice for the survivors and the families of the deceased. The protestors, who were mostly led by NGOs, chanted slogans against the government and the company to give them a fair amount of compensation. Interviews with the survivors revealed that 350 metric tons of toxic waste was still lying at the Carbide Factory and affecting people around the site who face air and ground water pollution. A group of survivors also protested in front of the Chief Minister of Madhya Pradesh, Mr. Shivraj Singh Chouhan's house. At all the places where protests were held, it was said that neither the state nor the Central government had done anything for these victims and both Congress and BJP (two largest political parties in India) had made false promises. The pictures show the protestors holding slogans asking "Dear PM, whose side are you on?"